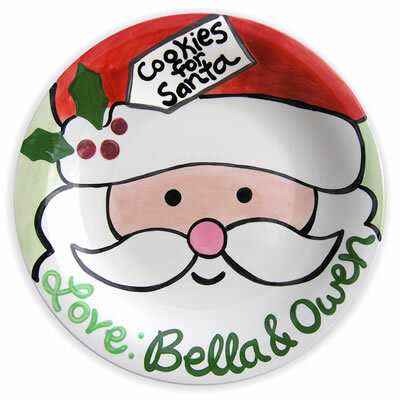 What better place for your holiday cookies left on Christmas even than our sweet Santa Face personalized plate. The plate features smiling santa at the center and red and green seasonal accents. A more personalized touch can be given to it by adding child or children�s name. The plate is available in both large 10 inch or small sizes with 8 inche diameter. This plate is painted with eco-friendly glazes to make it lead free and food safe. This beautiful tableware will be celebrated and cherished for lifetime. It will make an excellent childhood memory that will bring smile on everyone�s face.